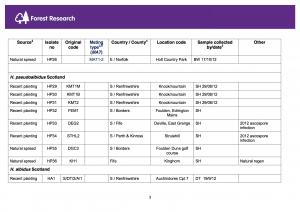 The ash dieback pathogen Hymenoscyphus pseudoalbidus is now to be considered established in eastern Britain (see distribution in this map) and samples regularly come into the laboratory at Forest Research for morphological and DNA-based molecular diagnosis. This has formed the nucleus of a culture collection of the pathogen which we are characterising, including analysis of mating type. 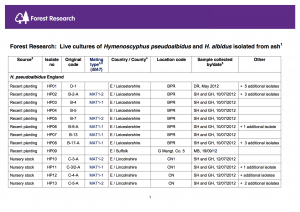 We used the multiplex PCR method of Gross et al (2012) to identify the MAT 1-1 and MAT 1-2 idiomorphs or sexual mating types of H. pseudoalbidus. Sequences of the primer products were in all cases homologous to the MAT sequences reported by Gross et al (2012). 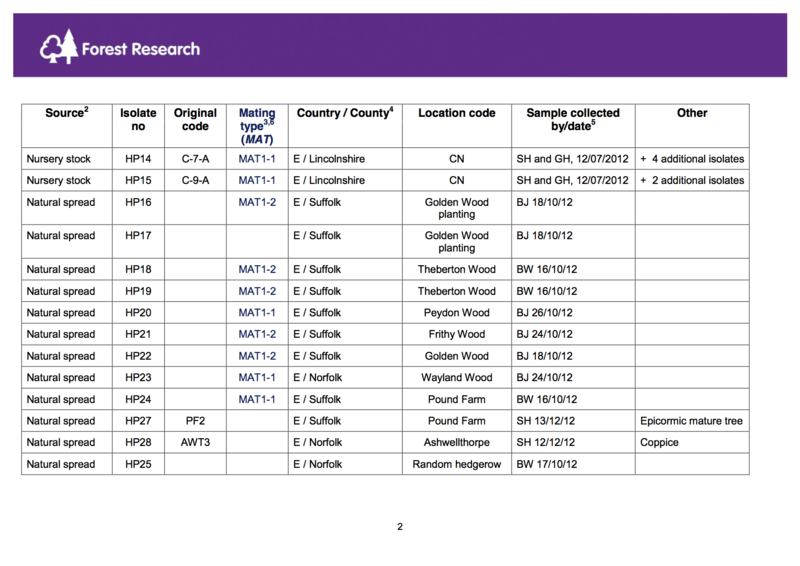 The mating types were determined for six isolates from individual trees at a single nursery in Lincolnshire; six isolates from individual trees at a single recent ash planting site in Leicestershire; and nine isolates from individual trees at seven different ‘natural spread’ or woodland sites in Suffolk and Norfolk. 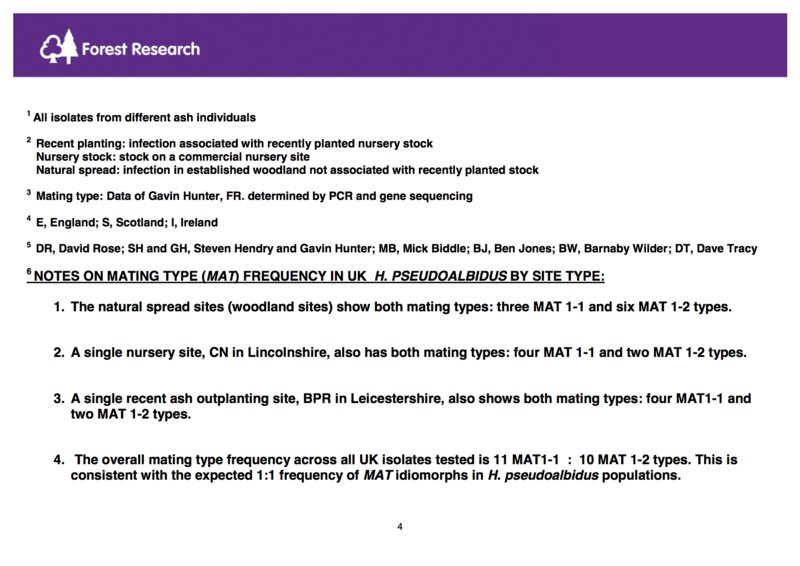 As shown in the Tables linked at the bottom, both mating types, MAT1-1 and MAT1-2, were present in each site type. The overall ratio of MAT1-1: MAT1-2types in the 21 isolates was 11 : 10. 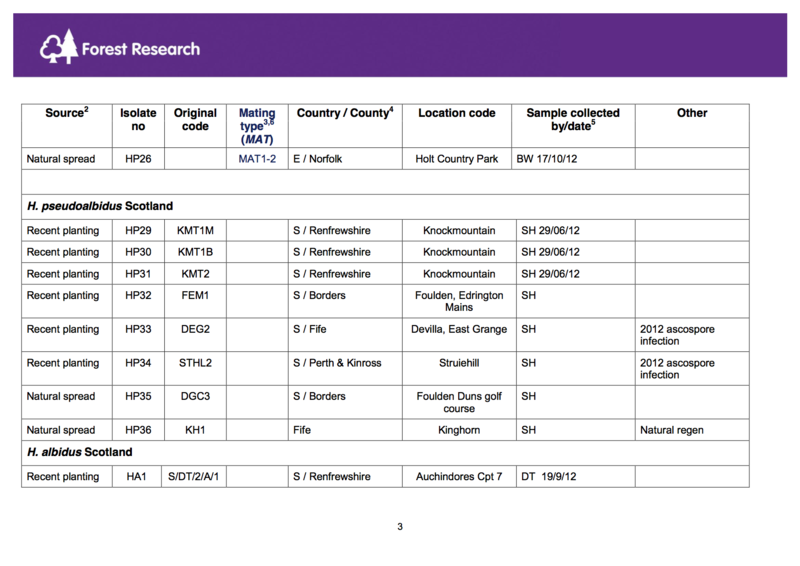 Ash nursery stock entering the UK can carry both mating types of H. pseudoalbidus onto a nursery site. Out-planting of ash nursery stock can also carry both mating types onto a new site. 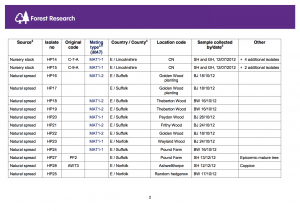 As already indicated by Diane Saunders (January 28) for Kenninghall Wood and Ashwellthorpe Wood (Norfolk), both mating types are present across ‘natural spread’ or woodland sites in eastern England. 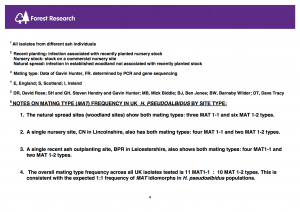 Across all samples the frequency of MAT1-1 and MAT1-2 types was close to 1:1. This is consistent with the previous report of MAT ratios of 1:1 in H. pseudoalbidus by Gross et al. (2012); and with what is expected for a regularly sexually outcrossing ascomycete.It is also consistent with reports of high genetic variability in H. pseudoalbidus elsewhere in Europe i.e. 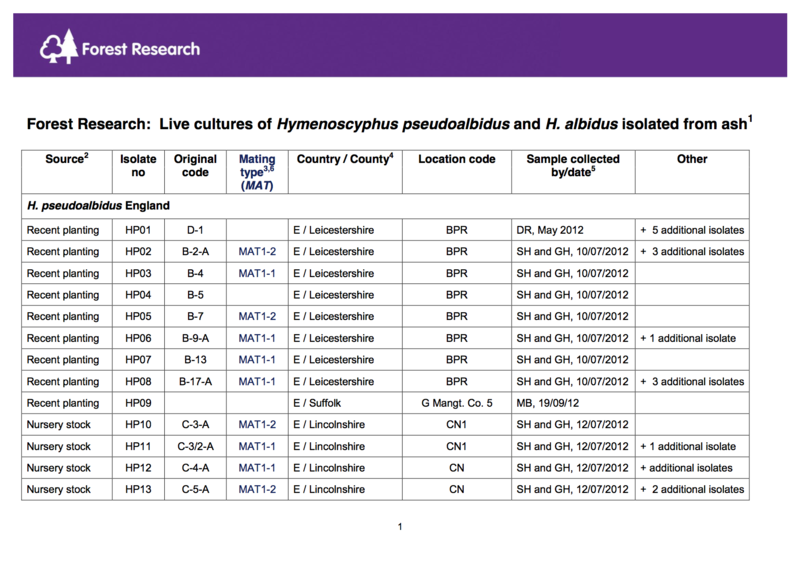 H. pseudoalbidus now being found in the UK is also likely to be regularly sexually outcrossing.